In case you’re not familiar with the term “busking,” I’ll address that first: Busking refers to the act of street performance; whether it be with instruments, magic tricks, or anything else involving a special talent. I have busked for many years in The United States, especially before I started getting bar and restaurant gigs. I still like busking when I’m in random cities, just for the experience. I’ve always found it to be a fun way to make a little bit of money and play for a small audience. It wasn’t until I got to Europe that I was keeping myself fed with my guitar. During the “Artists Abroad Trip” of 2013, we kind of got stranded for a whole month in Italy. We were draining money fast, and we still had 9 months of travel left to fund. We decided we would find somewhere to “pirate camp”—otherwise known as illegal camping—for the next month and try to save and make as much money as possible. Our search led us to Lido, Ostia, Roma Province Italy. It’s a small beach town about 45 minutes west of Rome. There we had located a nature preserve which we deemed to be camp-able via satellite images. It turned out to be a great spot! 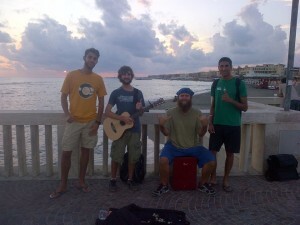 Our point-of-interest for busking was Ostia itself, which was two bus rides north of the nature preserve. It took us a couple days of mindless bus-wandering to locate what looked like a decent spot. This was not the first time we had busked in Europe, but it was without a doubt where our craft was honed. This one is more important than anything else. No one can give you money if there’s no one around. Our favorite spots were ones in which people were almost “forced” to hear us: Sidewalks, places next to intersections where pedestrians wait for traffic lights, piers where people walk around, anything like that. Don’t just smile. Smile at people. Look at the passers-by and act like you’re the happiest person on earth. Maybe even smile a bit seductively. I know that probably sounds a little weird, possibly creepy; but you can’t argue with results. We had a lot of girls walking directly past us, we’d shoot them a smile and then they’d smile, walk a little further and then walk back and drop some money in the case. You may get some phone numbers as well! Although, we should mention that our fraternization with the local donne usually ended abruptly with the sentence: “Yeah, we live in a nature preserve down by the beach.” Back on subject: Smile, smile, smile. Get Into it; Feel the Music! This may fall under the same category as the paragraph above, but I will mention it separately for clarification: Dance around, tap your feet, walk up to people and at the risk of sounding redundant: Smile. This is done to “inspire” people to throw money in. I’m not sure why it works, but it does! Maybe it has something to do with the human nature to fit in. Who knows. We had a system: Exactly €5.00 was placed in our guitar case before starting–one 2-euro coin, one 1-euro coin, a half-euro coin, and some assorted change. We kept it an exact number every day so we knew how much money we made at the end of our busking session. You should always thank people, but if you’re in the middle of singing, a simple smile and head-nod gets the point across without botching your performance. Thank everyone who tips. Sometimes I felt like people saw our gratification for other people’s tips and sought out a thank-you as well. This shouldn’t be a problem at all, considering you should feel grateful towards these people for enjoying your music and helping you out. Kids will love you. My drummer Corey was like some kind of superhero to them in Europe. The cajon drum fascinated them and they would stop dead in their tracks and stare, or start dancing. This is your cue: Start smiling! Laugh, and smile at the parents and at the kid; which usually comes very naturally because it’s incredibly cute to watch. Nine times out of ten, you’ll see one of the parents start reaching for their money pouch and hand some coins to the child to throw in your case. Feel good knowing you made some money and made a little kid’s day at the same time! This is harder than it sounds, even more so if you’re relying on busking-income to put food on your plate. One important thing to keep in mind is that you will have good days and bad days. The good news is that on the bad days your overall income shouldn’t be much lower than your average if you’re busking consistently. Consistently as in, playing in the same area, and following the basic guide of practices listed here. In Italy, we made an average of €25 per day. It would sometimes be a few euro higher or lower, but not by much. Just keep portraying an image of happiness; don’t even portray, but be happy. We discovered that people tended to feed off of our “good vibes,” so to speak. We learned not to take the money seriously while we were playing, even though it most definitely was. Learn to laugh at your situation, and by all means do it out loud. People tip happy musicians! This is something I never quite decided on. I would base your decision on this: Are you busking specifically to make money, or are you more focused on gaining more fans? If it’s the latter, make a creative and/or funny sign and lay out some business cards or free demo CDs. We tended to make more money with no sign, although in my opinion this could have been based on a myriad of variables; mostly location. It could take some experimentation within your area to find which method works best. 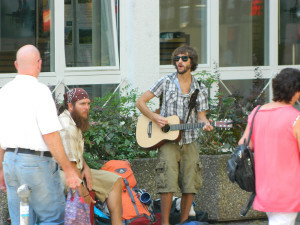 This applies only to busking specifically for extra income. We learned plenty of songs and perfected them while we were busking. To our constant astonishment, we frequently made more money during these “practice sessions” than our rehearsed sets! Keep in mind, we were also laughing at ourselves when we messed something up, and continued playing the song, which is a no-brainer for any experienced musician. Many people don’t even notice when you screw up, so don’t make it obvious by stopping the song. If you’re busking/gigging daily then trust me, playing some different songs will be a big relief from the monotony. This is coming from someone who already had a solid five to six hours of material before this experience. Your set list will get old! These statistics were gathered from my tedious recording of locations and profit of each time we busked. Bear in mind, there are variables which affect these numbers: Time of day, location, and luck. For example: We found that in touristy areas, such as the pier in Ostia, almost 80% of our profit for the day was made during sunset; about one hour. The better mood people are in, the better tips you’ll get. People getting on trains and such are generally not in a tipping mood, while people taking a walk along the pier at sunset are usually laid-back and feeling happy. Keep that in mind when you select a location. Busking in Europe is a wonderful experience. You will meet all kinds of awesome people, create wonderful memories, and hopefully make some extra traveling cash. Not to mention, it’s consistent practice. We learned almost 10 new songs during our three weeks in Ostia. Get out there and have a great time! If you’re looking for a little more reliable income source with your music, be sure to check out my guide on booking shows while traveling. Got any more questions about busking; or traveling as a musician in general? Leave a comment below or reach out to me on Twitter! If you’d like more busking tips and a LOT more tips for traveling musicians, making money while you travel, getting places to stay for free, and stuff like that, please consider grabbing a copy of my book Two Bucks to Timbuktu on Amazon. Glad the first day went well! Congrats on getting all your stuff soertd as well! Now go spend all that hard-earned money at a great restaurant just across the bridge from the Old Town side of Basel and part of a long row of restaurants/cafes. It’s called Zum Schmale Wurf and has very good pasta! Hey! Was there any problems busking without permits or a working visa for the country you were in? How did you avoid problems with that? Hello Tom, I’m cycle tourist and my new plan is cycling in Europe for three months, i play oriental instrument from Iran and i haven’t busked before. How do people treat buskers there? As begar? Artist? Some one with hands out? my instrument_setar_ is so quiet and i need an amplifier, light and small. Any advice would be appreciated! Hi, i’m from Mexico city and i play the violin on the street here. I’m planning a trip to France (Paris, Bordeaux and other cities) next september and i want to play there, so your blog really inspired me, but i have a question i hope you can help me with. I always play with a microphone connected from my violin to an amplifier in which i also play the music tracks i use… do you know or think if this (the use of the amplifier) could be a problem to play on the street? So for your question, it really depends on the city you’re busking in. Some are more strict than others. In my experience the best thing to do is just assume you are allowed. The worst that will happen is someone will tell you to stop! I have had this happen probably almost as many times as I’ve had a successful day of busking. When it does, I kindly apologize and tell them I will move on (or turn the amplifier off) and there have never been any problems. It is always best to ask forgiveness rather than permission in these kinds of cases. If you’d like a free copy of the ebook version, just drop an email to tom@tuneupandtravel.com and I’ll send it over! I have been street performing violin/fiddle at farmer’s markets in Minnesota for a few years (where I can sometimes make $30/hr on a good day). I am all accoustic – no electronics. I was recently in ‘s-Hertogenbosch in the Netherlands during the Duketown Jazz Festival. I found a busy spot near the Wilhelmina Bridge, 500 meter from the train station, and played for an hour. I kept my repertoire mostly in the jazz genre of music. I was a little disappointed to make (what I thought was only) 7 euro 60 after one hour. My best money making tune was the local classic “Het Leven is Goed in Het Brabantse Land” – I might have made better income if I had picked a better location or time, then again I did not start with any seed money in my case, and the Dutch are known to be as thrifty as Scots. We were staying with family, so I could only squeeze my street performing adventure in between other social events. My Dutch sister-in-law was astounded that I just went out and played… and made money! – she kept asking if I had been afraid that I might get arrested – I wasnt (though it also helps that I can speak Dutch). I am planning to try busking again on my next trip to Europe… possibly Spain. I have read bad things about busking in Madrid – though I believe the mayor of Madrid (who passed the licensing rules on busking) is now out of office. Has busking improved in Madrid since 2016? How is the street performing situation in Avila (near Madrid)? Hello TOM , I’m Brazilian and I’m going to go to Europe next year. I’m going to get a tourist visa for 3 months and I intend to travel and play Brazilians classic like bachianas, villa lobos, choros, in the streets to reduce my expenses, I know there are licenses according to the countries but playing on the streets being tourists can I be deported or have some problem? I have been a busker now for over 15 years busked mainly in the Northeast of England, York, Newcastle, Durham etc. Also did a stint in Bournemouth last year. I was chatting to another busker in Newcastle last Thursday we decided to share pitches as Newcastle is very competitive even at this time of year. A lot of pitch hogging going on. Any ways long story short this guy has done a fair bit of traveling around Europe and he has inspired me to do the same your article also has. I was thinking of starting in Newcastle and working my way South to Dover taking in towns such as York Leeds Manchester Birmingham Bristol Bath Bournemouth Southampton Portsmouth Brighton then on to Dover and from there to Calais Paris etc then from Paris to Germany with a few stops in between of course. I was planning on taking a tent etc just in case I can not find cheap accommodation. Was thinking of using hostels etc. Really looking forward to this planning on leaving my home town the last day of April. Apart from a passport what other documents would be useful ? Great read! I’m not sure if it was mentioned, but did you actually have any permits when you were busking? How did you get away with it if not? I’m heading over to Europe this July/August to busk, travel and grow my craft overall. Did you play any original songs or did you stick to popular covers? That’s a great thing to bring up, and one that I get asked often. Maybe it’s time to update this article! Anyway, the answer is no. No permits, no work visa, nothing like that. I never ran into any trouble. I always figured if I did, I’d give the classic “Oh gee, sorry, I didn’t know!” line. Haha. I did probably a 60/40 mix of covers/originals. And, of those covers, about 20-30% are what I would call “popular” and that’s mostly classic rock and oldies tunes that most people know. (I don’t really play any modern pop music). In my experience, it’s not the “what” but the “how” when it comes to the amount of tips. The happier you are playing, the happier people are to throw tips in the case. That’s how it’s been for me, anyway! I’m currently working on a new book (sort of a breakaway, musician-focused version of my book Two Bucks to Timbuktu) that covers everything from traveling with a guitar to busking to booking shows to making money with music online to crowdfunding. I’d love to send you a beta copy when it’s ready! Shoot an email to tom@tuneupandtravel.com if you’re interested. Thank you soso much for uploading this article! It helped me alot in planning my !first! busking travel [excitement detected ^^]. To be honest I am not that sure, where exactly to go in Europe. Are there any places you can highly recommend and others you would not recommend? I’d very much like to buy your book but is there by any chance an epub version, as I’m not using Kindle. Thanks. As for so-called busking, I have some personal experience too, but not solo. We formed an acoustic duo (a classical guitar and a mandola – a bigger sister of mandoline) with a friend, who spent most of his life as a traveling musician. We started in Amsterdam (I’ve been living and working there for 3 years) and made a “tour” through Europe 10 years ago (how the time flies, eh). I had the time of my life. In my opinion, every musician, pro and amateur, should at least try this. And the street… the street has a life of its own. A totally different perspective. And I totally agree! A different perspective and I made so many new friends during my time busking!